With the opening of the MLB season, a golf outing called the Masters teeing off, and hockey and NBA basketball playoffs just around the corner, there are a lot of upcoming events for sports fans to enjoy. 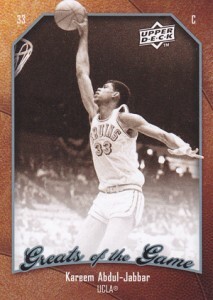 What I'm geeking out about, however, is the 'kickoff' of the Kareem Abdul-Jabbar v. Upper Deck trial. The trial starts April 12, with a bit of a pregame hearing on April 11. I'm looking forward to this trial for two reasons. First, this case could be critical in determining when celebrities, athletes and entertainers need to give permission (i.e. get paid) to be on trading cards. A ruling in favor of Upper Deck would clarify the legality of unlicensed products. This could open up the market to new manufacturers and products. On the other hand, a ruling in favor of Abdul-Jabbar could entrench the status quo and ensure that celebrities, athletes and entertainers can reap the rewards of others using their images. Second, most intellectual property cases are quite boring, but this one is as exciting as they get. Professional athletes will be testifying! Also, given allegations that Upper Deck CEO Richard McWilliam showed up drunk to a deposition likely will be heavily beaten by Abdul-Jabbar's attorney throughout the trial. Heck, if video excerpts of the deposition aren't played during the opening statement, I'd be shocked. For some pregame teasers, Abdul-Jabbar's attorneys recently filed excerpts from the most recent deposition of McWilliam. You see, Abdul-Jabbar's attorneys still want the court to sanction Upper Deck for McWilliam's previous actions, including what they contend is continued evasiveness on McWilliam's behalf. Also, they contend that Upper Deck has been evasive in discovery throughout the case. The sanction Abdul-Jabbar's attorneys want is for the court to throw the case out. In the alternative, they want a fine assessed against the defendants. It's unlikely the case will be thrown out in its entirety. However, it would not surprise me if the defendants are sanctioned in some form. Abdul-Jabbar's attorneys also argue that even though McWilliam eventually gave a full seven-hour deposition, during it he "exhibited signs of intoxication, including smelling of alcohol and slurring his words, and he was combative, uncooperative, evasive, nonsensical and belligerent." I guess McWilliam did not read my pointers for deposition article. I mean, Rules 1 and 2 were don’t be "combative" and don’t be "evasive"! Jabbar Attorney – Have you had any alcohol in the last 24 hours? McWilliam – Not that I recall. No. JA – You don't recall if you had any alcohol in the last 24 hours? MC – No. Well, I don’t recall any so I don’t believe I had any. JA – Okay. Mr. McWilliam, I'm going to ask you again if you’re--if you're—you have taken any alcohol in the last 24 hours? Because it seems to me that you’re having difficulty remembering some things and you're slurring your words. I’m just going to ask you again. Have you had any alcohol in the last 24 hours? MC – No, not that I recall. JA – How do you spell that? MC – L-E-H-M-A-N. You sure you haven’t been drinking in the last 24 hours? I mean that's a pretty easy thing to have—understand. L-E-H-M-A-N. Lehman. Anyway. I’ve answered your question. Please proceed with your next question. JA – You said—what was the doctor's name that you mentioned at Lehman Medical? MC – Well, my third time L-E-H-M-A-N. Lehman Medical. MC – That was his name. JA – His name was Lehman Medical? JA – Did he have a first name? MC – I would really be guessing. What I think could get the defendants in trouble is their continuing reliance on McWilliam's "medical condition" which required the cancelling and rescheduling of depositions, and McWilliam's failure to attend a mandatory settlement conference. JA – ...What was the nature of the emergency that prevented you from appearing at your deposition on February 24th, 2012? MC – Yes. I have a medical issue. MC – I answered the question. JA - So did you have a—let me ask you this. Did you have a medical issue that prevented you from appearing at your deposition on February 24th, 2012? MC – I’ve already answered that question. It's clear that Abdul-Jabbar's attorneys are angling that defendants are using the "medical condition" excuse when McWilliam is actually intoxicated. If Upper Deck cannot identify the "medical condition" to the court (heck, even in closed chambers outside of the ear of the public), I could see the judge sanctioning the defendants in some respect. As for the outcome of this case, this may come as a surprise, but I'm rooting for Upper Deck. I think trading cards are basically little encyclopedia entries. Who an athlete is, what he looks like, what his statistics are--they’re all historical facts that should be able to be preserved for posterity. Because of that, no one should be able to own pieces of history. Now, I don't think you should be able to use athletes' images to sell cars, TVs and fruit snacks. That's different. But when it comes to actual, historical events--that should be public domain. The actual outcome, however, I believe will differ from what I'd like to happen. I think Abdul-Jabbar will likely win this matter, and not because of the "right of publicity" issues that should be front and center, but because of these side issues. It's going to be very difficult for a jury to concentrate on abstract legal concepts if they keep focusing on whether the head of the company being sued is being evasive and combative. Now, setting aside my predictions, we all know that anything can happen. That's why we play the game. And that's why I will anxiously be watching. Doesn’t UD have to pay NCAA? Shouldn’t that cover them just like it does EA sports and anyone else that makes money off college stars. Yes u know this is not about a guy that is in or just out of college but it is about the use of his college picture and info right? travis craih (ID 39817) � That is an excellent point.